Blogging is ever evolving and really so are we as people. So it's only natural if you are a blogger you learn and change things on a monthly basis. Meaning in the last year I've discovered and changed a great deal of things. As we are nearing the end of the year (I really don't know where this year has gone?!) I thought I'd put down a few things I've learnt and changed when it comes to blogging... as I felt I needed a ramble about blogging! A bit of a boring one to start with but something that's really changed in the world of blogging in the last year. I'm talking sponsored posts. I feel not many blog readers love them (unless they are done well) so I'm sure most will be glad to know they aren't as prevalent. The reason for this was a big change is Google's guidelines this year, meaning all sponsored posts should only include 'no follow links' but as a lot of brands were only paying for sponsored posts for the benefit of 'follow' links they now see no reason for them. Of course if brands are savvy they will see that sponsored posts do open up their products/brands to targeted blog readers... but that's if they value bloggers; most sadly don't. In the past I did make money from sponsored posts (always marking them as sponsored) so I'm now definitely learning new and improved ways of making an income from blogging without the aid of sponsored posts, which I kind of prefer! Readers will embrace a mix of posts! Over the past few months I've mixed up my beauty posts with a few lifestyle type posts. This is not only refreshing for me to be able to write about other things I love but also you've all really seemed to like them. In fact my recipes posts on Bloglovin' get over 500 likes - crazy! This has taught me that as much as I like a mix of things, so will you. This has really made me enjoy blogging that bit more! I've always used Twitter as a tool to promote my blog and a way to chat to people but over the last year I've used it more often and loved it! Joining in with hash tags/chats, especially the #bbloggers one can be so much fun and it's also a great way to find new blogs to read. I've also started to be a bit more savvy in my approach of marketing my new blog posts and found including an image from the blog post makes people more likely to favourite or re-tweet it - a handy little tip. I love rambling to anyone and everyone so if you want to chat (especially about Christmas!) or have any questions really do feel free to tweet or follow me @Makeup_savvy. For many bloggers feel PR samples are integral to blogging and I can totally see why... blogging about all the latest releases and buying the products yourself can get extremely pricey! But it's important to think about what type of blog you want to have and what your readers will enjoy seeing/reading. From my own stats I know that single product reviews aren't that popular whereas collective blog posts where I feature products I've used and loved for a long time are enjoyed much more. Also storage/collection posts and random ramblings on blogging, such as this post, are also popular. These don't require me hoarding endless PR samples so I don't really feel I need them. Also I'm now aware that if a company do send me products I don't need to review them ASAP or even at all if I don't feel they fit with my blog or wouldn't be interesting in reading about. I feel I could go on all day about how bloggers as a whole could improve on this, though I'm aware I still have a lot to learn myself, so I might just dedicate a blog post to it sometime soon. Being organised isn't a strong point of mine but over the past 6 months I decided to make an effort as a little experiment! Previous to this I would only blog for the day ahead, photograph products without any structure and allow myself to procrastinate endlessly - but I've now managed to change that all around! Grant I'm still an expert at wasting time... generally on Twitter and Youtube, but I created my own Weekly Blogger Planner (you can actually print it out for free here) which has organised my brain no end, now have two set photographing sessions per week (so needed in winter when it goes dark before 4pm) and I'm now just on top of things a lot more. This has reduced stress so much and I'm actually really motivated to blog now. If you're a fellow slow-coach unorganised blogger then I'd highly recommend writing down the areas you fall down in and then how to can change that around, then just start implementing it! It's really as simple as that. 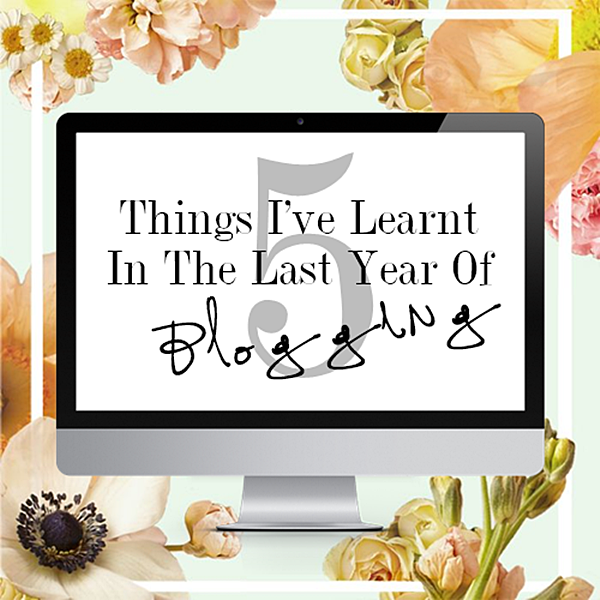 If you're a blogger I'd be really interested to know what has changed for you this year and what you've learnt! PS. Had a total blog makeover! Would love to know what you think of it.